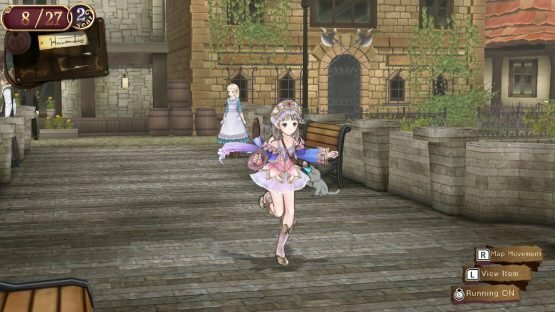 Atelier Totori follows the hapless, clumsy and unsure Totori (known as anime protagonist archetype C) as she learns the ropes of her role as an Alchemist in the small village of Alanya. Along with confident, sword-wielding childhood friend Gino (anime archetype E, sub-set B), they set out to become Adventurers, the unnecessarily respected dogsbodies of this world. Aided and impeded by a variety of similarly archetypal non-player characters, Totori has to navigate what it means to be an Adventurer, meeting others along the way and generally getting into increasing levels of trouble. There are other sub-plots that run alongside the central thread, such as the disappearance of Totori’s mother and a few callbacks to other games in the series, but these largely do not affect the main narrative. My first gripe with the game lies here, in that it is largely typical, not deviating from the norms of the genre, and resulting in a bland set of characters, settings, and narrative beats. Take the achievement of becoming an Adventurer for instance. Rather than this being some grandiose moment, it essentially leaves the characters acting and doing exactly what they were doing before getting their licence. This childhood dream of Totori is completed with minimal effort, to barely any ceremony, and with no real change in the proceedings so it leaves the whole thing feeling disappointing and lacklustre from then on. This isn’t made any better by the characters themselves remarking on the pointlessness of the venture either, coming across as a slap in the face to the player instead of a knowing fourth wall-breaking statement, if it was even intended in that way. The gameplay falls down sadly too, forgetting the old adage of “jack of all trades, master of none’, and going with a scattershot approach to attempt to nail what feels like every possible mechanic in the JRPG genre. 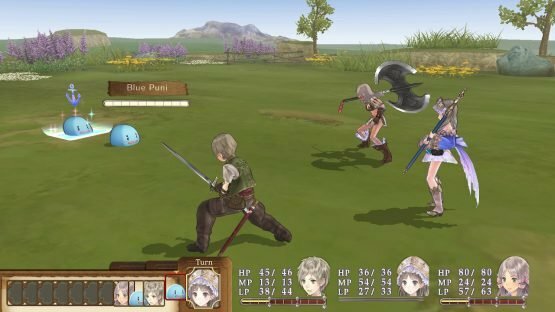 You have turn-based battles, greater challenges in boss battles, a visual novel-style story, sub-quests, and a crafting system through alchemy, to name but a few. The only problem is that it fails to make any of these interesting or engaging. The whole gameplay premise is based upon a time system, of which almost every activity takes a certain amount of in-game time to play out. Travelling around the world map, harvesting resources all takes time, with a calendar in the top-left of the screen marching ever onwards as you play. Everything in the game adheres to this strict set-up, so you really have to be mindful of the time at every moment of play. Most of the main problems in the game lie in the Quests, almost all of which are sub-quests and most of which are utterly brainless busywork. 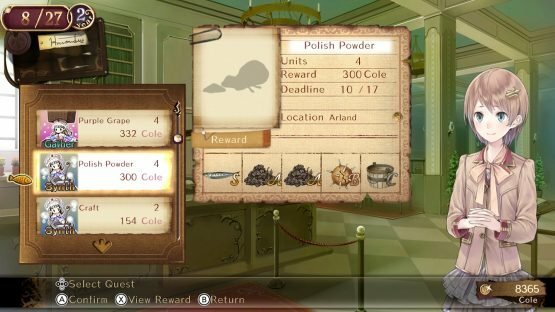 These can be tasking the player with killing a certain number of a certain creature, collecting a set amount of a particular resource, or using alchemy to create a certain number of items for firstly the owner of the bar in Alanya, Gerhard, and others later in the game. This wouldn’t be so bad if they didn’t seemingly constantly repeat themselves, weren’t essentially required for raising your Adventurer Rank, or had strict time constraints and need to be completed before a certain date or you get reprimanded for it. This all adds up to an unnecessary frustration in a game that really doesn’t need more negatives. It’s after the first and only time I was essentially told off for failing to hit the time constraint on a quest that I began to question why I was still playing this game, but I digress. Battles are solid yet dull, not trying anything new, but work fine enough to not be a burden on the player with only the boss battles proving to be a substantial challenge (as it should be, really). The alchemy is much the same, a solidly created system that works, if one that is initially indecipherable as the tutorials do not really adequately explain it. Although this could be that I missed it in the encyclopaedia that confronts you when you begin the game. Visually, the game is absolutely stunning, if a little generic. All of the characters, locales and monsters are visually distinctive and beautifully rendered, making the world feel cohesive. The only problem here being that although visually distinctive from one another, the characters are essentially a rogues gallery of typical visual designs. It’s pretty, sure, but lacks any kind of substance. The same goes for the music in the game, which is so painfully generic that it made no impression on me at all. 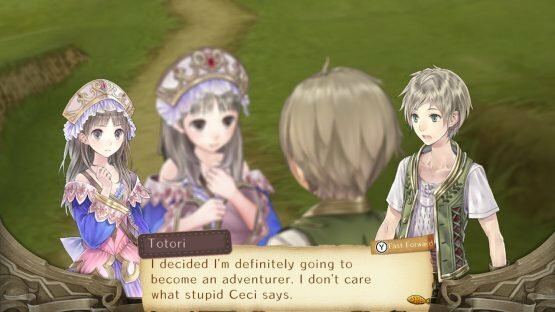 I simply cannot recommend Atelier Totori for Switch. I can understand why many would love this type of game, and what’s here is the solid basis for a great game, with an at least decent attempt at some of its mechanics. But the sheer unabashed emphasis on busywork is just painfully dull and repetitive. I left the game feeling like if only a few of the mechanics were dropped and the remainder refined, it could be a fantastic JRPG. However, the whole experience felt like an overly waste of my time, topped off by the fact that upon ranking up as an Adventurer, the NPC running the guild instructed me that the rank up had taken too long and it wasn’t good enough. Upon this statement, I promptly closed the game down and greatly doubt that I will open it again.